Makeup lessons are ideal if you want to update your look, improve your routine or learn new skills, techniques and tips. When it comes to teaching makeup application, I take each individual into account, creating a lesson that’s ideal for your style, requirements and needs. No two lessons are the same. I take the time to create a unique look just for you, to suit your lifestyle. From your day to day look that can be applied quickly as easily in the morning, to makeup for nights out and special occasions, my lessons are tailored to suit your unique needs. In addition, I can teach you to make the most of the products you own. You may feel like you have invested a lot of money into a variety of products, but find that many of them never get used. I can help you make the most of what you already have, and recommend essential products that will work wonders for you as an individual. My lessons can be carried out at a location and time that suits you, I’m also happy for you to come to me, whatever you prefer. In my one on one makeup lesson, I work with you to create your own unique lesson, to ensure you get the most out of the experience. I start by taking the time to fully understand your needs, lifestyle and what you want to achieve. I take a hands on approach to create the perfect makeup looks for you, before you try to create the look for yourself, with me guiding and advising you. For one on one makeup lessons, I always encourage you to bring along your full makeup kit, including the products you’re unsure of or never use for us to look at. In addition I will recommend a few essential products that work for you as an individual. Each lesson will last 2-2.5 hours, during which we will create the perfect makeup look for you. At the end of the lesson you will take home a list of any recommended products, and later you will receive a list of my favourite products as well as a full guide to create your unique look. I teach you techniques that can be applied for a number of different looks, teaching you skills that will last a lifetime. Group lessons are ideal for hen dos, parties, pampering and general celebrations, and are particularly great if you have an event coming up that you are all involved with. In my group lessons I still take the time to understand each individuals unique needs, creating a lesson that is tailored to your group. During the lesson I demonstrate the chosen look on one group member, before allowing you to each create the look yourself. During this time I work my way around each individual, offering my guidance, advice and ideas. I encourage each group member to bring their own makeup bag to help you better understand how to use the products you have, to create the best look possible. I take the time to advise and answer any questions you might have, ensuring each individual gets the most out of the lesson. To add to the occasion, I supply bubbly for all, so that you can get in the party spirit and really enjoy your group makeup lesson. Finally, after the lesson I send you a face chart with a complete guide for the new techniques and application that you have learnt. My bridal makeup lesson is ideal for those who are planing a destination wedding, but want to avoid the added expense of flying a makeup artist out for the big day. In addition, many brides may prefer to apply their chosen look themselves, but would like help creating the perfect bridal makeup look. During the lesson, I will help you determine the exact look you want to go for for your big day. We will work together to create something that suits you as an individual perfectly, that suits your style and your personality down to the ground, but that also aligns with your vision and expectations. I will then demonstrate how to achieve your look, followed by you trying it for yourself, with me guiding you and advising. The techniques I teach you during your lesson will also be able to be applied to your every day makeup look. The skills you will learn can be used through out your life, not just on your big day. If you like, I welcome you to bring a friend, relative or bridesmaid. Through years of working with brides to create their look for their big day, I know that your loved ones opinion matters, they can even help you apply your look on your big day! After the lesson, you will take away a list of my recommended products for you. 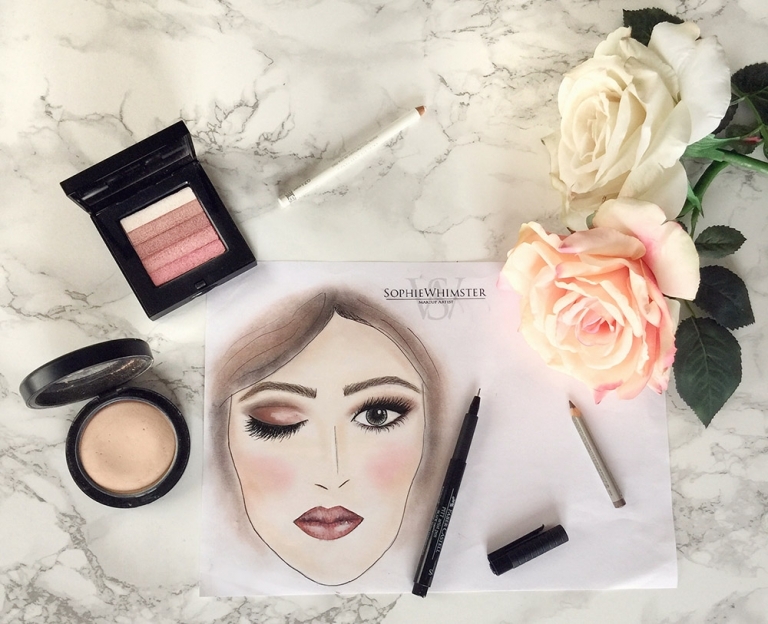 I will also send you a bespoke face chart to help you recreate your look.